Pleiones are an extremely attractive group of orchids related to Coelogynes. Worldwide, there are about 20 species in this group of totally deciduous, colourful bulb orchids from very cold areas of northern India and China, to Burma and northern Thailand, Laos and Taiwan. They grow from a small round bulb in Spring and the flower spikes produce one or two spectacularly large flowers up to 10cm in diameter before the leaves are produced. These orchids are increasing in popularity in many areas and a huge amount of hybridising is currently taking place within the group. There are some extremely good websites specialising in Pleiones and it is recommended you investigate them if your interest runs in this direction, e. g. Kool Plants or Pleione Info. 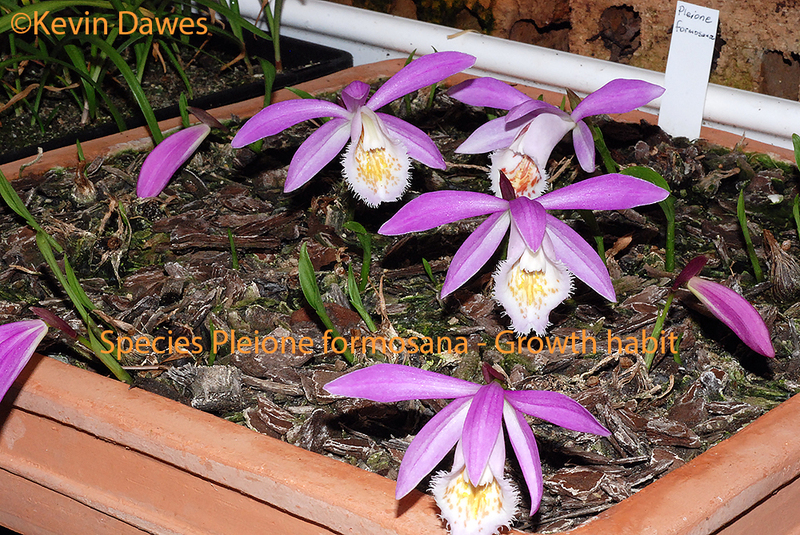 In Australia the only freely available species is Pleione formosana although there are a few varieties and some hybrids between various Pleione species that have been imported from around the world. Because of its huge pretty flowers and the lush pink/mauve and purple colours there have been many attempts around the world to hybridise Pleione with Coelogyne. These combinations between an evergreen plant and a deciduous plant invariably fail but the strange thing is that the pods of either parent are easily fertilised and the seed is very viable. I have deflasked literally hundreds of seedlings only to watch them gradually die over the following few months. I know people who have even tried over-wintering the seedlings in specially lit cool rooms! I have a handful which have matured to big flowering size plants but show no sign of flowering. Others have reported that a rare flower is produced but is simply a variation of one of the parents or is very deformed. The Royal Horticultural Society (London) registered a successful hybrid several years ago as Coeleione Chantilly Lace. 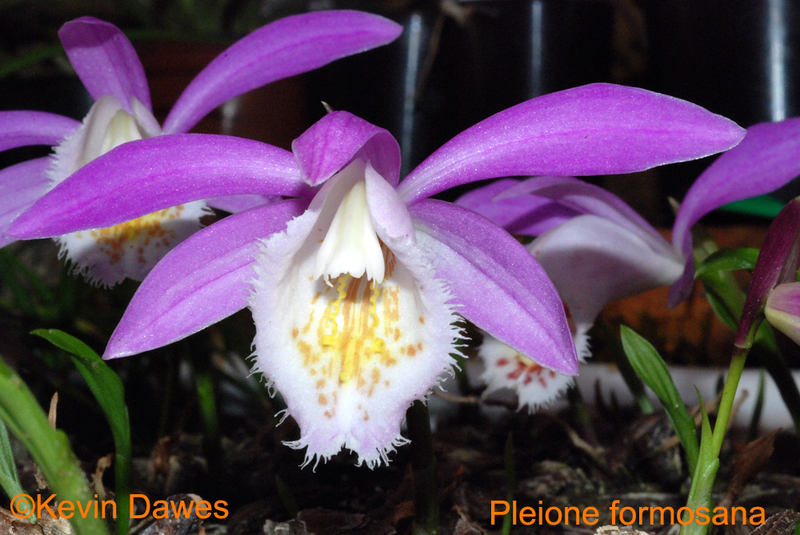 The new name of Coeleione is from a combination of two distinct genera - Coelogyne and Pleione. To date no photos have been publicly available or on the internet of this flower. Negatives: Their deciduous habit requires some special techniques for cultivation, especially in relation to over-wintering the psuedobulbs. Varieties: Refer to the above websites. Hybrids: There is a rapidly increasing number of new registered hybrids of Pleione. See the websites above.